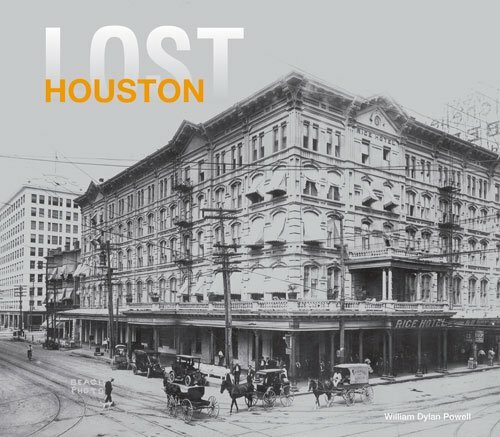 Lost Houston explores how the buildings, streets and institutions that comprise Houston’s cityscape have transformed over the years—and what’s been lost along the way. Subjects include long gone buildings from the 1800s that include the old capitol building of the Republic of Texas, the original Rice Hotel (first called the Capitol Hotel), the first Binz Building, the Houston Light Guard, Grand Central Station, the old Houston Ice & Brewing Company, the Moorish Federal building at Fannin and Franklin, the Houston Lyceum and Carnegie Library, Houston’s first network of electric light rail lines, the original wooden buildings on Main Street and more. In the early 20th century, Houston blossomed—and Lost Houston captures many interesting things from that time now lost such as the grand old No-Tsu-Oh parade, the Lucas Gusher at nearby Spindletop, the surreal Coney Island-like Luna Park, Camp Logan, the first Miller Outdoor Theatre and more. Lost Houston also covers faded phenomenon from the ‘40s, ‘50s and more such as the Texas Rocket train that went from Houston to Dallas (not a new idea after all), the Houston-Galveston Interurban rail line, all of the magnificent early downtown movie houses now lost to history, the grand old art deco Houston Municipal Air Terminal (today the 1940 Air Terminal Museum), the old Buffalo Stadium and its popular ball team, local ice houses, the controversial bright orange Gulf Lollipop sign atop the Gulf Building, the sci-fi looking Trailblazer Monorail, Howard Hughes’ Gulf Brewing Company and its popular Grand Prize beer—and more! The book even covers more recent loses including the Shamrock Hotel, Sam Houston Coliseum, Felix Mexican Restaurant, the Houston Oilers (Love Ya Blue!) and of course, the Eighth Wonder of the World—the Astrodome, which has been in various stages of “Lost” for years. Whether you’ve grown up in Houston and want a bitter-sweet trip down memory lane (very bitter in the case of the Oilers) or you just want to know more about the city around you, Lost Houston is a fun and vivid look into Houston’s past.